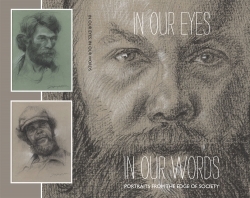 In Our Eyes In Our Words - Portraits from the Edge of Society, a collection of 100 charcoal portraits of homeless people drawn from life by artist Jeff Horn, wins a gold medal for fine art in the 2019 IPPY Awards. Why: Jeff Horn, one of California’s leading fine artists and educators, has produced a book of portraits of homeless people, drawn from life more than 20 years ago. Many of the drawings in the book include a written statement or story made by the homeless person who sat for the portrait. Through the generosity of more than 50 backers Jeff has gifted more than 500 autographed copies of the book to California agencies, advocates, and community leaders as a way of showing appreciation for their exemplary efforts.